Music lovers got their first glimpse of the Paynesville Area High School marching band at the final band concert of the year on Tuesday, May 15. This outdoor concert - held on the PAHS football field - used a scary music theme. The band played a selection of songs while doing some field routine. Songs included Bach's "Tochatta and Fugue," Santana's "Evil Ways," and the theme music from the movie, "Psycho." The high school band members performed 'scary' music while doing a field routine in their annual outdoor concert. The weather was fine for the concert, expect for the strong wind that blew the sound away from the audience. "The wind caused some trouble for us because we were having trouble hearing each other," said director Bryan Mara. During a break, Mara announced his senior awards for 2000-01. Becca Gardner won the John Phillip Sousa Award for overall excellence, and Corey Schmitt won the Louis Armstrong Jazz Award. Mara said the awards could have been switched, as both were very deserving. Schmitt is a trumpet player who has played in the jazz band for four years. He plays lead trumpet parts and solos. "He has a great feel for music, so he plays a lot of great improvisations," said Mara. The jazz band recently went to a festival at the University of Minnesota-Morris and had ten students perform improvisational solos, which is the most soloists that Mara has ever had. Gardner didn't start in band until high school. Already trained on the piano, she learned the bells, xylophone, and vibraphone, as well as auxiliary percussion instruments. She played piano, vibes, and sang for the jazz band. At individual and ensemble contests this year, Gardner accompanied 16 acts on piano, while also playing a percussion solo and in a percussion ensemble. She and Schmitt tied for the best performance of the night by their judge. Paynesville claimed four of the five "best of the night" awards from judges at that contest. Mara also gave out merit awards to seniors who showed great dedication to the band and always had a positive attitude. These winners were Nathan Martinson and Erin O'Fallon. For the concert finale, the band marched on the track and played its summer marching music twice. The music is challenging for marching, said Mara, with off beats and tempo changes. "I think we've got a pretty good piece of music picked out, and the students are working on memorizing it," he said. Drum major for the band this summer is junior Nic Glenz. Martinson is the drum line captain. 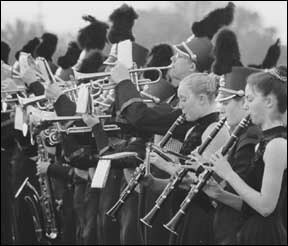 A tentative schedule for the 2001 marching band season for Paynesville Area High School was released last week at the outdoor band concert, where the band made its debut performance.